Why are Delhi and other cities in India unsafe for women? Why Are Some Cities in India Unsafe for Women? 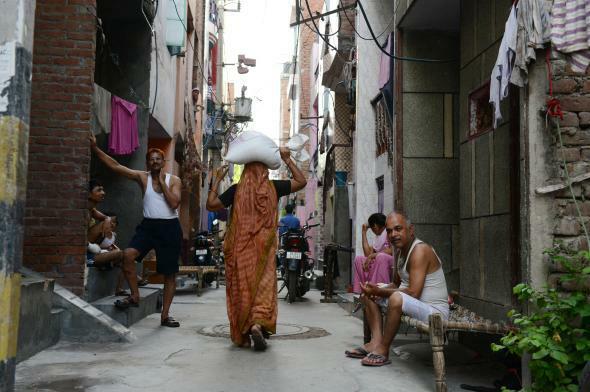 An Indian woman walks home with a bag of rice she got at a government food dispensary in New Delhi on July 10, 2013. Delhi is unsafe for women. No doubt about that. Having lived in Delhi for almost three decades (having used public transport regularly, having walked alone on busy roads as well as secluded lanes at peak hours and otherwise), I have come to the conclusion that my family and I are as much to blame for the lack of safety and ridiculous fears that our gender experiences as the next ruffian eyeing me at every corner. Why? Because the minute someone pounces, pinches, or comments on me, I, like every other woman, have two choices: one, to retaliate and make it clear that it is unacceptable, and two, cower down, look for the shortest route home, and make a mental note to avoid that particular road, shop, locality, or corner whenever possible. Very, very unfortunately, what all girls are taught to do is the latter. And I used to do that myself, until I realized how horribly wrong this choice is. I never discouraged an indecent man from repeating his actions; I only emboldened him by reaffirming his idea of power over me. And I single-handedly made it so much worse for all the girls and women who were about to cross that place after I did by not discouraging the man to try it again. As Gandhi had once said, “Whatever you do will be insignificant, but it is very important that you do it.” All the insignificant acts add up to become a trend and then the general norm. If all the women (and their men) cumulatively begin to flout these criminal-friendly “rules” and agree to step out at night or visit “unsafe” areas, will the rates of crime against women drop overnight? No. What will happen will be a subtle shift among the general people, of what is acceptable and what is not. If many people choose to visit a location late at night, they’ll notice that the place is perhaps not well-lit or patrolled and try to do something about it. By deserting the city in “unsafe” hours and passing judgments on those who become victims, we make it a cakewalk for criminals to try whatever they feel like, with the least sense of fear of law and society. A criminal getting up the next day to watch the news and hear social opinion that burdens the victim with part of the blame (for dressing a certain way or being at a certain place) must feel so smug about himself and what he did. As he builds on his confidence, he doesn’t feel fazed by anything and doesn’t hesitate to shift his crime now to crowded public places, daylight hours, etc. Cities like Mumbai, Bengaluru, and so on are indeed not so plagued by extremely outdated patriarchal mindsets, and that does play a part in how a crime is planned, carried out, and dealt with by the society in the aftermath. However, it is the choices that people make that set off the chain reactions. As we in Delhi keep reiterating and accepting that it is unsafe for women, we keep, in some ways, ensuring that it remains so. Arranged Marriages: Do arranged marriages in India really work? Culture of India: Do Indian men lack respect for women? New Delhi, India: How can Delhi be made safe for women?